With a thick layer of biscuits, smothered in golden caramel, topped with sliced bananas and freshly whipped cream - what’s not to love! The condensed milk needs to be prepared the day before to allow it to cool down and extreme caution must be taken in this process. Place the tins of condensed milk into a large saucepan and cover fully with water. It is important to ensure that they are continuously covered with water. Bring the water to the boil then reduce the heat and allow to simmer for approximately 3 hours. Remove from the heat and allow the cans of condensed milk to cool in the water, preferably overnight. Using either a food processor or a plastic bag and a rolling pin, crush the biscuits into small pieces. Do not make them too fine as it's nice to leave a little crunch in the base. Melt the butter and add it into the biscuits to bind them together. The mixture should not be too wet at this stage. Press this mixture into a 10 inch cheesecake (spring form) tin and place into the fridge to set for a few minutes whilst you make up the topping. Open the cans of condensed milk and spread the caramel over the prepared biscuit base. This should give a lovely thick layer of sweet caramel. 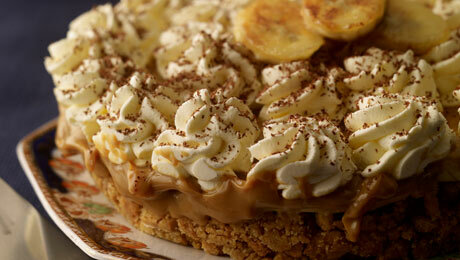 Next peel and slice the bananas, and place a layer on top of the caramel. Add the whipped cream, then drizzle with the melted chocolate. Transfer the entire dessert to the fridge for at least one hour to set. Remove the cake from the tin and transfer onto a serving platter. Decorate with some fresh berries (optional) and serve.